This week, EWG updated our interactive map of sites across the U.S. contaminated with toxic fluorinated compounds, known as PFAS chemicals, to include more communities. The tally of known polluted sites now sits at 172 locations in 40 states, including military bases, civilian airports, industrial plants and dumps, and fire training sites. On Wednesday, Sen. Tom Udall, D-N.M., joined EWG, other public advocacy groups, and Americans impacted by the industrial solvent trichloroethylene, or TCE, to demand that the Environmental Protection Agency carry out proposed bans on high-risk uses of the carcinogenic compound. The personal care product giant Johnson & Johnson announced this week that it would begin to provide additional details on fragrance chemicals used in its baby products. EWG applauded the company’s step in the direction of transparency, as it will set a precedent across the industry. Summer is in full swing, and over on our Children’s Health site we provided some helpful tips for parents trying to pick the right sunscreen for their kids. Additionally, EWG analyzed comments submitted to the Department of Agriculture that show a number of major food companies and trade groups support mandatory disclosure of genetically modified organisms in food. We also sounded the alarm on a recent study by the North Carolina Clean Energy Technology Center that shows major utility companies are scheming for ways to raise the utility bills of their customers who have installed solar panels. 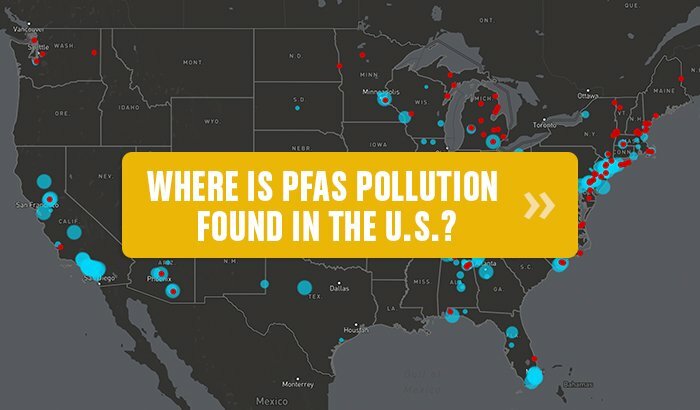 As ProPublica reported in July, new analyses of water data show that the Environmental Protection Agency and the Department of Defense minimized the threat that the compounds pose to the public, and contamination is more extensive than the government has officially acknowledged; scientists at the Environmental Working Group estimate that more than 110 million people have been exposed to PFAS through drinking water. A paper mill that made food contact products is a good place to start looking for sources of PFAS contamination, said Tasha Stoiber, a senior scientist at the Environmental Working Group, a nonprofit consumer watchdog group that has studied the PFAS family of chemicals for 20 years. The Environmental Working Group is national advocacy organization that’s been tracking the spread of known PFAS contamination across the country. About a year ago, the group said there were 52 known sites in 19 states; Their latest interactive map shows that there are now 172 sites spread out across 40 states. It’s too late for preemptive action on this issue — contamination is rampant nationwide, exacerbated by the lack of action by the EPA. Today, the U.S. Army says there are 146 military sites contaminated with PFAS and PFOA. Environmental Working Group released a study showing that up to 16 million Americans use drinking water with such contamination. Reprinted in The Charlotte Observer. Kari Rhinehart said her daughter died at the age of 13 from a rare brain tumor. She later discovered there were high levels of TCE in their water. In a new study, the Environmental Working Group found 14 million Americans were exposed through drinking water. “I don’t know how any chemical could possibly have the value that makes it worth a child's life,” said Rhinehart. EPA is now doing another evaluation of TCE, which Melanie Benesh, legislative attorney for the Environmental Working Group, says is not necessary for the federal agency to move forward with its ban. Ensminger, flanked by other families impacted by the toxic water, made his plea Wednesday during a news conference on Capitol Hill to urge the EPA to ban high-risk uses of the carcinogenic compound known as trichloroethylene, or TCE, which is impacting an estimated 14 million Americans, according to the advocacy and research organization Environmental Working Group, which publicized the findings after studying EPA-mandated tests. Reprinted by American Military News. At the news conference, held by the Environmental Working Group, Udall and families who blamed TCE exposure for their children's cancers urged EPA to finalize the proposed bans on certain uses of TCE to prevent future exposures. Groups like Safer Chemicals, Healthy Families and the Environmental Working Group joined with families of individuals who have been harmed by TCE exposures at the press conference, in a campaign not dissimilar to one earlier this year on methylene chloride. The Environmental Working Group (EWG) is going after the Environmental Protection Agency (EPA) for rescinding proposed bans on trichloroethylene (TCE) under the Trump administration. According to the EWG, the cancer-causing industrial chemical has contaminated tap water supplies serving more than 14 million Americans. In its report, the Washington, D.C.-based Environmental Working Group stated that based on analysis of utility tests performed in 2015, 321 drinking water systems were found to contain Trichloroethylene, or TCE. In half of those systems, the group added, the contamination was found to be at levels above a guideline for safe drinking. MindBodyGreen: Johnson & Johnson is hopping on the transparency train with its baby products. The Environmental Working Group issued the following news release: Today Johnson & Johnson, one of the largest multinational manufacturers of consumer packaged goods, announced a new transparency initiative that will provide additional details on fragrance chemicals used in its Johnson's baby products. “Despite the rhetoric of ‘preserving the family farm,’ the vast majority of farmers do not benefit from federal farm subsidy programs and most of the subsidies go to the largest and most financially secure farm operations,” the Environmental Working Group said in a statement. “This is really a devilish problem,” said Craig Cox, a senior vice-president for agriculture and natural resources at the Environmental Working Group who is tracking the issue. “The more I look into it, the more stunning the state of play seems to me.” Reprinted by KQED. Scrubbing down shower tiles with lemony-fresh mildew remover could come with health consequences. The Environmental Working Group uses Tilex Mold and Mildew remover as an example. This product contains sodium hypochlorite, which could cause respiratory issues or eye and skin irritation if you don’t use it in a well-ventilated area. Since scrubbing your shower requires close proximity, Tilex is quite concerning. Mix 2/3 cup Super Washing Soda, 3 Tbsp baking soda, 1/2 cup liquid Castile soap, and 5 cups water—and take solace in knowing all ingredients are rated as the best of the best by the Environmental Working Group, according to Fey. Big Green Purse: Do You Know These 5 Secrets to Non-Toxic Wood Floor Care? Environmental Working Group (EWG.org) has evaluated many of the floor cleansers on the market for the toxicity of their ingredients. They look at the likelihood of the ingredients to trigger asthma or other respiratory difficulties or skin allergies and irritation. But if you'd rather be safe than sorry, finding clean beauty products, which are formaldehyde-free, is easier than ever. "The Environmental Working Group has a list of not only formaldehyde-containing products but also products that contain formaldehyde releasers," says Dr. Shamban. “It’s mind-blowing that a carcinogenic ingredient like formaldehyde is still used in nail treatments,” Carla Burns, a research analyst for the Environmental Working Group (EWG), told me. She’s referring to products like nail strengthener from OPI that contain the carcinogen. Yoga and Spa Magazine: What’s in Your Cosmetics? We have a meeting with the Environmental Working Group, which is also based in D.C. They come by to preview the new store and share their plans for their new EWG-verified product lines. Existing government farm support programs also guarantee minimum revenue for farmers if commodity prices fall below national or county averages. Those provisions paid out well over $10 billion in 2016 and will also be triggered this year, said Craig Cox, senior vice president for agriculture and natural resources at the Environmental Working Group, an advocacy organization that tracks farmer payments. By far the most important program is crop insurance subsidies, in which taxpayers foot more than half of the cost of insurance premiums for some farmers. This program alone has cost $83 billion since 1995, not including the payments to crop insurance companies, according to the Environmental Working Group. Listen up, salad eaters Opens a New Window. : Spinach has two times the pesticide residue Opens a New Window. of other crops, while at least four different pesticides can be found on a single tomato, according to new guidance from the nonprofit Environmental Working Group. NorthJersey.com: Should I buy organic food for my children? People can also check the Environmental Working Group’s annual “Dirty Dozen” list, which ranks fruits and vegetables based on pesticide contamination. In addition to the items Kim named, the list includes nectarines, grapes, cherries, pears, tomatoes, celery, potatoes and sweet bell peppers. The Environmental Working Group has released its Dirty Dozen list for 2018. If you love these fruit and veg, buy organic or wash them thoroughly before eating, especially if you have them raw. But both regulatory and consumer pressure on the substances continues to grow, with the Environmental Working Group (EWG) launching a campaign for oxybenzone to be phased out of sunscreens nationwide by 2020. FitDay: Sunscreen Protects Your Skin, but Is It Hurting the Environment? Sites Skin Deep, the Cosmetic Safety Database by Environmental Working Group, allow you to check the safety of your sunscreen by looking up either the brand name or active ingredients. For other sunscreens, check Environmental Working Group's (EWG) annual list. A good resource of sunscreen products that meet the group's safety criteria in addition to recommendations by your personal dermatologist. The Environmental Working Group keeps a running tab on the best sunscreens that are deemed safest for your skin and health, but it's worth noting that, while some studies on ingredients like oxybenzone and octinoxate show them to be hormone disruptors, results aren't entirely conclusive. The Wall Street Journal: Have You Met This Cow? She’s Delicious. The various certifications on food can become confusing. There are now at least 30 common claims and certifications for meat, eggs and dairy, according to the Environmental Working Group, a Washington-based advocacy group focused on public health. Advocacy groups call for greater action. Another report recently published by the Environmental Working group found an increase of antibiotic resistance in ground beef and pork chops. EPA considers dioxane a likely human carcinogen, and last August, the Environmental Working Group, an advocacy organization, detected dangerous levels of the compound in the drinking water of 27 U.S. states. New York Magazine: What Are the Best Shower Water Filters? If you filter your drinking water to avoid potentially harmful chemicals, it’s not a huge leap to consider a shower water filter. According to Olga Naidenko, Ph.D., a senior science adviser at the Environmental Working Group (EWG), chlorine, a by-product of water disinfection, is commonly found in municipal water supplies, as well as hazardous volatile organic compounds (VOCs), including the carcinogenic trichloroethylene.